Interstate 220 loops around the west side of Jackson between I-20 east of Clinton and I-55 at the city of Ridgeland. U.S. 49 accompanies the freeway northward to Exit 5 as part of a bypass route around central Jackson in conjunction with I-20 east to Pearl. Mostly with four lanes, I-220 travels through older retail and suburban areas west of Jackson State University, by Hawkins Field Industrial Complex, and an array of business parks along the Madison County line. Interstate 220 crosses the Madison County line just beyond the entrance ramp from Hanging Moss Road. The freeway concludes at I-55 in two miles. Photo taken 05/03/12. Angling northeast one mile ahead of I-55, Interstate 220 passes between Highland Colony Business Park and Tougaloo College. Photo taken 05/03/12. I-220 runs along the Ridgeland city line leading into the directional T interchange with Interstate 55. Photo taken 05/03/12. Two lanes combine with I-55 north through Ridgeland, Madison and the northern suburbs of Jackson. An unnumbered ramp leads drivers south back to Jackson. Photo taken 05/03/12. Succeeding interchanges join Interstate 55 south with Old Agency Road and Natchez Trace Parkway in Ridgeland ahead of the separation with I-220 south. Photo taken 05/09/16. Exit 105A loops away from I-55 south for Natchez Trace Parkway, a 444-mile long road from Natchez, Mississippi to Nashville, Tennesssee maintained by the National Park Service. Four lanes continue south to Interstate 220 at Exit 104. Photo taken 05/09/16. 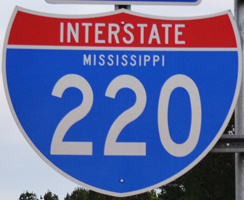 Interstate 220 heads southwest from the directional T interchange (Exit 104) with I-55 to western reaches of Jackson. Photo taken 05/09/16. South beyond I-220, Interstate 55 travels along a commercialized stretch into the capital city of Mississippi. Photo taken 05/09/16. I-55 crosses County Line Road and Ridgeland city limits within 0.75 miles of Exit 104 to Interstate 220 south. Photo taken by Rich Piehl (12/01). I-220 leads motorists back toward the west side of Jackson from Interstate 55 at Ridgeland. Photo taken by Rich Piehl (12/01). U.S. 51 branches eastward from I-55 just ahead of the exchange (Exit 104) with I-220 south. Photo taken 04/13/02. A lane drop occurs along northbound Interstate 55 at the two-lane flyover for I-220 south. I-55 continues north 193 miles to Memphis, Tennessee. Photo taken 04/13/02. U.S. 80 crosses paths with I-220 just north of Interstate 20 along an older retail corridor between Clinton and Jackson. Photo taken 05/09/16. I-220 & U.S. 49 continue with three southbound lanes across John R. Lynch Street to the full Y-interchange with Interstate 20. Photo taken 05/09/16. Two lanes separate at the south end of I-220 for Interstate 20 west 36 miles to Vicksburg and I-20 east & U.S. 49 south three miles to their overlap with I-55 north. Photo taken 05/09/16. Mississippi 18 converges with Interstate 20 at Exit 40 east of the city of Raymond and just west of I-220 and U.S. 49. Photo taken 09/07/09. A third eastbound lane opens along I-20 at the Robinson Road overpass for Interstate 220 north toward Memphis and U.S. 49 north to Yazoo City. Photo taken 09/07/09. Eastbound at the left exit for Interstate 220 to northern Jackson and Ridgeland. Photo taken 09/07/09. Interstate 20 west & U.S. 49 north part ways at I-220, one mile beyond the cloverleaf interchange (Exit 42) with Ellis Avenue. Photo taken 05/03/12. U.S. 49 accompanies Interstate 220 north 5.2 miles to Medgar Evers Boulevard, the pre-freeway alignment through Jackson. U.S. 49 continues another 39 miles from there to its separation into east and west branches at Yazoo City. Photo taken 05/03/12. 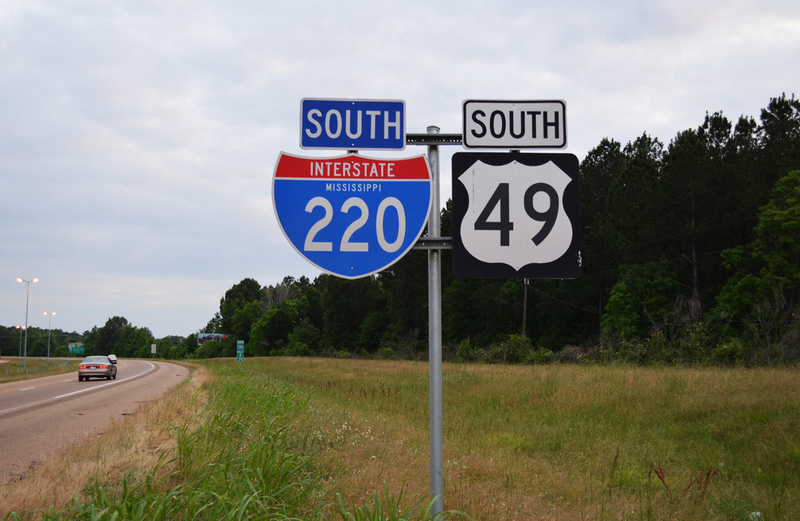 Interstate 20 reduces from six to four overall lanes at the exchange (Exit 41) with I-220 and U.S. 49 north. Beyond Exit 41, I-20 turns northwest toward the city of Clinton. Photo taken 05/03/12. 3-digit Interstates from I-20 (Kurumi). I-220 and Industrial Drive Interchange. http://www.gomdot.com/news/projects/industrialdrive.htm Mississippi Department of Transportation (MDOT), project web site.